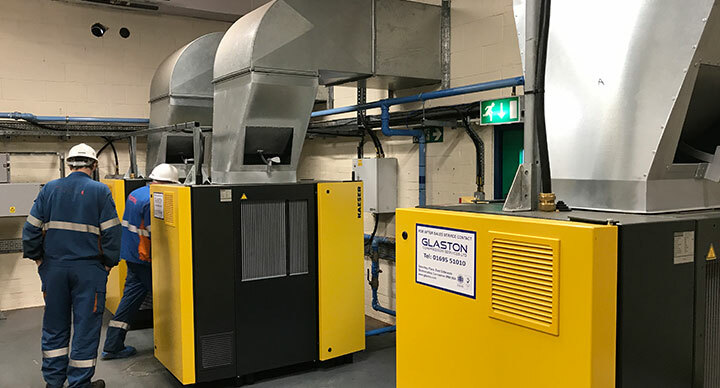 Glaston are experts in air compressor installation: from the design, building and installation of intelligent control and energy management systems. Our systems are designed to provide maximum energy savings and cost efficiency. Our air compressor installations provide complete accountability and can be used with virtually any multiple air compressor installation. This includes high pressure applications, gas and nitrogen generation and vacuum and cooling water systems. Our knowledge and experience in air compressor installation allows us to offer our clients bespoke controls, designed and manufactured to suit your specific requirements. Our range of high quality air compressor fittings is matched with service excellence. We offer our customers the very best in both product range and services to ensure optimum energy savings across their operations. Our air compressor design and installation service is dedicated to providing 100% customer satisfaction. This professional, comprehensive service is carried out by qualified engineers to ensure all air compressor installations are safe, reliable and efficient. We offer an air compressor installation service for a range of leading brands: including Atlas Copco Compressors, HPC compressors and KAESER Compressors. We are the authorised distributor of HPC KAESER Compressors and have built a strong reputation across the UK for our attention to detail and high level of service. At Glaston, our team is highly qualified and has a wealth of experience in air compressor installation. We recognise that each client has specific requirements and have the expertise to offer professional, reliable advice to each client. Our team delivers innovative design solutions to a range of industries including food, chemical, engineering, pharmaceutical, nuclear and packaging.